We started to monitor Elasticsearch's popularity more than four years ago. In these four years, Elasticsearch became the most popular search engine and it has been one of the top three systems in our DBMS of the Year award in 2014. The steady growth in its popularity as measured by our popularity score is really impressive: they started with a score of 7.4 and are now at 115.98. This is a 15-fold increase in our ranking components such as mentions in job offers, in LinkedIn profiles, in Google Trends, or in activity on Stackoverflow. 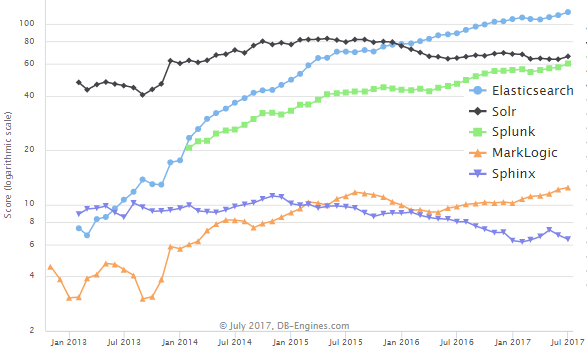 Elasticsearch was at rank 21 four years ago in our DB-Engines Ranking, and it is now the first search engine in the top 10. There is no shortage of strong competitors in the enterprise search engine market: Solr, the former number one, based on Apache Lucene just like Elasticsearch. Then we have Splunk, MarkLogic, and many others. Despite all of this competition, Elasticsearch managed to be used in some of the most complex and prestigious projects: Wikipedia is using Elasticsearch, and so is Ebay, Yelp and Netflix. But Elastic, the company behind Elasticsearch, has ambitions that go further than pure search technology. They have developed the Elastic Stack around its search component, which includes Beats and Logstash for data collection and Kibana for data visualization. This tool set is often used for log search and analysis, thus moving beyond the traditional search engine market, while still using Elasticsearch as its key component. Elastic also puts a strong focus on the growing DBaaS market: they offer their own Elasticsearch-As-A-Service cloud solution, but there is also Amazon Elasticsearch Service and Google announced to offer the Elastic Cloud product on their Google Cloud Platform later this year. In addition to that, Elastic keeps acquiring startups in various fields, most recently they made efforts to add machine learning into their product portfolio. Such a strategy is certainly not without risks, but so far, Elastic seems to manage their challenges quite well. We will keep an eye on that product to see whether they can go beyond what they already achieved.